After becoming a full-time housewife for months now, I finally know there are so many house chores involved in running a household. One of the most difficult one would be laundry cleaning. Every day, I have to clean the kids shirts, hubby’s suits, and my shirts. On weekly basis, there are curtain and carpet cleaning. It is an exhausting and never ending task, how I wish to have a maid to help me out. 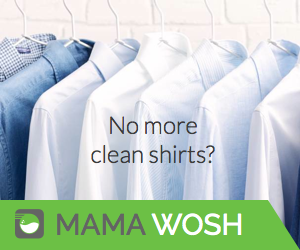 But hey, I have recently discovered an all-in-one laundry and dry cleaning provider - Mama Wosh that offer free pickup and delivery service in KL and PJ. 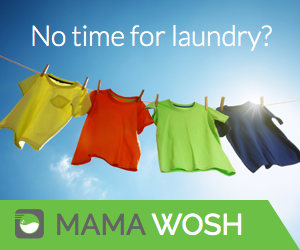 Mama Wosh provides on demand and hassle free, all-in-one laundry and dry cleaning service. 4. Clothes will be returned the next day (for normal wash and fold) or within 3 days for hand wash / dry cleaning. It’s that easy! If you are not too sure about the process, they have an interactive customer service that would answer your quires in no time. It’s safe to leave your dirty laundry to Mama Wosh’s trained laundry angels and it is easy to made payments online. Customer could even select fast delivery from its express options available, isn’t that cool? Mama Wosh and her busy cleaning angels are working 24/7. You can place an order 24h a day, 365 days a year. Their pickup & delivery angels are working from 8 am – 10 pm, on weekends from 9 am – 9 pm. You could use my Referral Code 'MWONREF0GFS9V' when register and try it out. Ah.. I desperately need such a service. When are they expanding to Ipoh?? Love that they do pick up. I hate do laundry.